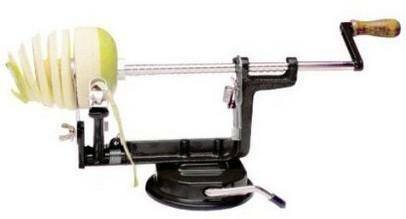 Apple Peeler, Corer & Slicer only $12.99! Home / Deals / Online Deals / Amazon Deals / Apple Peeler, Corer & Slicer only $12.99! I am loving this amazing deal going on today on Amazon on this Apple Peeler, Corer & Slicer! Right now you can grab this great kitchen item for only $12.99 + FREE shipping from Amazon Prime! This Apple Peeler, Corer & Slicer is regularly priced at $39.99 but right now it’s on sale for only $12.99 + FREE shipping from Amazon Prime. This is an awesome price on these, I have one that I use all the time it makes slicing apples for kids or Apple Pies so easy. This is definitely one of my favorite Kitchen tools, it’s also great for feeling potatoes!